Preschool Playbook: 3-2-1...To the Moon! One of our most popular summer camps has always been Space Camp. Unfortunately, we were unable to run it this year. The teacher for that camp always had such wonderful ideas for the children and they loved it. The children would come back year after year saying, "I remember when we....in Space Camp." We missed it this year. The children always finished up the week by making rockets and shooting them off. So I got the information from the teacher and thought I would share it with you. Before I begin I would like to talk about the film canister. We had two different kinds at our house. One kind had a lid that went on the outside of the top rim. DID NOT WORK WELL. The other lid pushed down inside the canister. This film canister worked great. The other canister leaked and all the water and fizzy stuff came out so it never took off. I know these canisters are from a brand of film that we bought at Wal Mart in a green and white package. I'm sorry I'm not sure of the name. It wouldn't be inexpensive as I always buy the least expensive film. 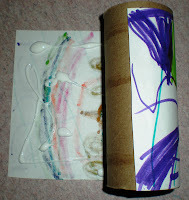 Give each child a toilet paper tube, and piece of construction paper, I cut my paper to 4x6 1/2. Let the children decorate the paper any way they like. We used marker which ran quite a bit during take off. The kids didn't mind, but just an FYI. 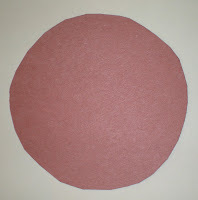 While they were decorating I cut some circles about 3 1/2 inches in diameter for the nose cone. 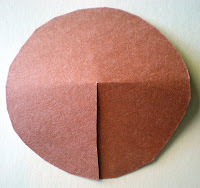 I then put a slit to the middle of the circle and shaped it like a cone. I used tacky to hold it together. 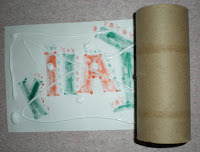 When the children are done decorating, let them glue the paper to the toilet paper roll. We used tacky here again. I just think it holds better. The last two steps were mine as they involved the hot glue gun. First I put some hot glue around one rim and stuck on the nose cone. 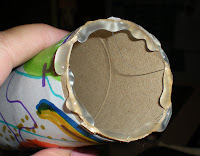 Next I put tons of hot glue inside the tube at the opposite end to hold the film canister in for the fuselage. Let everything dry. 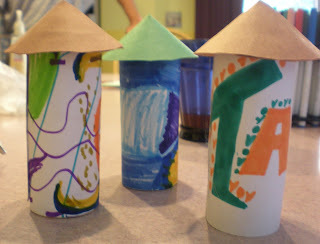 For take off you will need a container of water, Alka seltzer, (the fizzy kind), and your rocket. Put about 1/2 of an Alka seltzer tab in the canister. (Sometimes I just threw in a whole one). 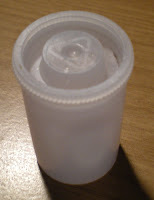 Then using another film canister, fill it about half way with water, then pour it into the rocket's fuselage. Quickly pop the cap on the canister--easier said then done. Set the rocket on the ground and--BLAST OFF! I found the more water I used, the lower peak height of the rocket. Good luck and have fun. The kids love watching the rocket blast off. We are going to do space & rockets here int he next week or so this is PERFECT! Zorro will LOVE this! yes, I remember doing this with my 2nd and 3rd graders. It was always a big hit! You have so many great ideas! I love sharing them with my little one. so much fun! My girls loved watching the video. That's such a fun, hands on way to explore rockets. Thank you for sharing this idea and writing such a great tutorial.